Happy New Year, everyone. 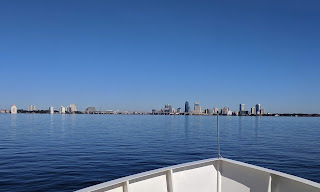 As we begin the final month of our sixth year living aboard Vector, we are underway outbound on the St. Johns River, bound for sea and thence to Port Canaveral. After two hours of climbing uphill, the tide has turned and we have the current behind us. We should arrive in Port Canaveral sometime after noon tomorrow (Monday), dependent on ocean current. I expect it will take me much of the afternoon to complete this post, and we''l be offshore off the northern Florida coast when it finally posts. It has once again been nearly three full weeks since I posted here. Normally, that would leave me with, if you will pardon the expression, a boatload of things to update. But in actual fact, we were not even on the boat. Now that we've left Ortega Landing in our wake, I can share that a key reason why we took a month at a marina here was so that we could secure the boat and fly to California together. Approaching Jacksonville on a gorgeous day, coming down the St. Johns from the Ortega. We flew out on the 19th, the very day of my last post, and in fact, most of it was typed on the flight out, continuing a long tradition of typing blog posts under way. And we returned in the wee hours of yesterday morning, arriving back at Vector around 1:30am. Fortunately, our bodies were mostly on Pacific Time where that was just 10:30pm. And while revealing this only after our return makes it sound like we were on a cloak-and-dagger mission, the reason is much more mundane: we did not want to advertise to the world that our boat would be unattended for a little over two weeks. Long-time readers who followed us during our adventures in our 40' motor coach, Odyssey, may recall that anytime we had to leave the bus unattended for several days, we simply did not announce our location until we had safely returned. That let me announce all manner of upcoming trips, wherein I usually wrote that the bus would be at "an undisclosed location." Similarly, we never posted a map link or a detailed location when we parked on the private property of friends or certain businesses, in respect for their privacy. Things are a bit different on the boat, inasmuch as we simply can't hide our location. The same transponder that keeps us safe in major harbors, around blind corners on rivers, and in limited visibility also makes us easy to track. And so it is that we felt discretion to be the better part of security in this case. Regular readers will also know that it is very rare, indeed, for us to both leave the boat together. Between the ongoing demands of the boat (which, unlike the bus, can't just start its own generator should the power go out and the batteries get low, for example), and the demands of having an 18-year-old cat with only one kidney, we usually find it simpler for one of us to remain aboard. Thus it was that Louise went to California for three weeks without me back in October, and I deployed alone to the Virgin Islands the previous year. 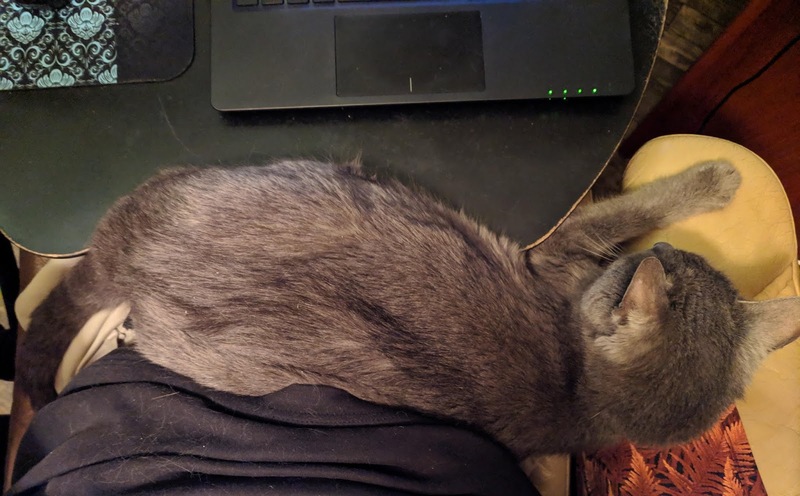 The cat is so love-starved from two weeks in "jail" that she's spent an uncharacteristic amount of time on my lap. Here she is interfering with route planning last night. Like the October trip, this one was necessitated by family medical issues. And while Louise could have again gone on her own, that would have us spending the holidays apart. Beyond that, we had already been planning to make a quick pilgrimage to the SF bay area in late January, after first getting settled in someplace in South Florida for a long-term stay, just to tend to business there and catch up with our many friends from two decades spent there. So we opted to just go together and roll that visit into this trip. We booked ourselves into the Hilton Santa Clara for the holidays, because it required the least number of points from my Hilton HHonors balance. I was expecting to have to buy breakfast every day, but on check-in they upgraded us to the Executive floor, which has a complimentary hot breakfast in the concierge lounge every morning, and hors d'oeuvres each afternoon. The lounge also had a great view of all the holiday lights of WinterFest at the Great America amusement park right across the street. Both the Hilton and Great America have been there for years, but now that landscape is dominated by Levi's Stadium, where the 49ers play. On game days, the hotel has to clamp down on parking. We had an excellent Christmas dinner of roast beef with all the trimmings at the home of our good friends and nieces in Menlo Park, opting to leave the car at the hotel and ride-share so we could imbibe. It was a great evening. And then, like clockwork after a long airplane trip, I came down with the crud and was down for the count. It's a good thing our room was nice, because I spent the three days we had carefully budgeted for bay area visits in bed, watching a Godfather marathon. Leave the gun, take the cannoli. I did drag myself out for a pre-scheduled meeting with our financial planners, who are in San Jose, and to do a quick walk-through of the building where our condo, which we rent out, is located. The afternoon hors d'oeuvres, which we had expected to miss entirely during our stay, saved me from having to drop thirty bucks on a sandwich and beverage in the business-hotel-priced restaurant in the lobby. 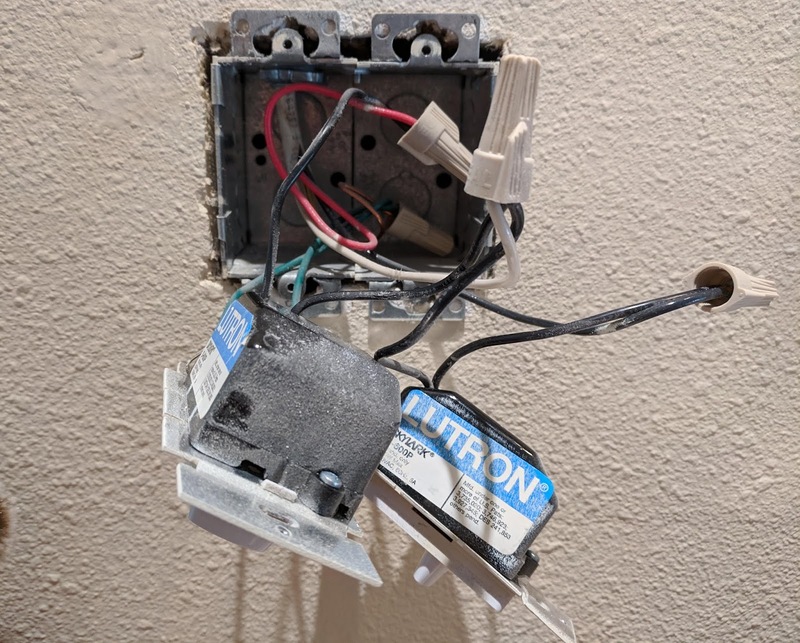 My in-laws changed all their ceiling lights to LED without realizing the dimmers also needed to be updated. 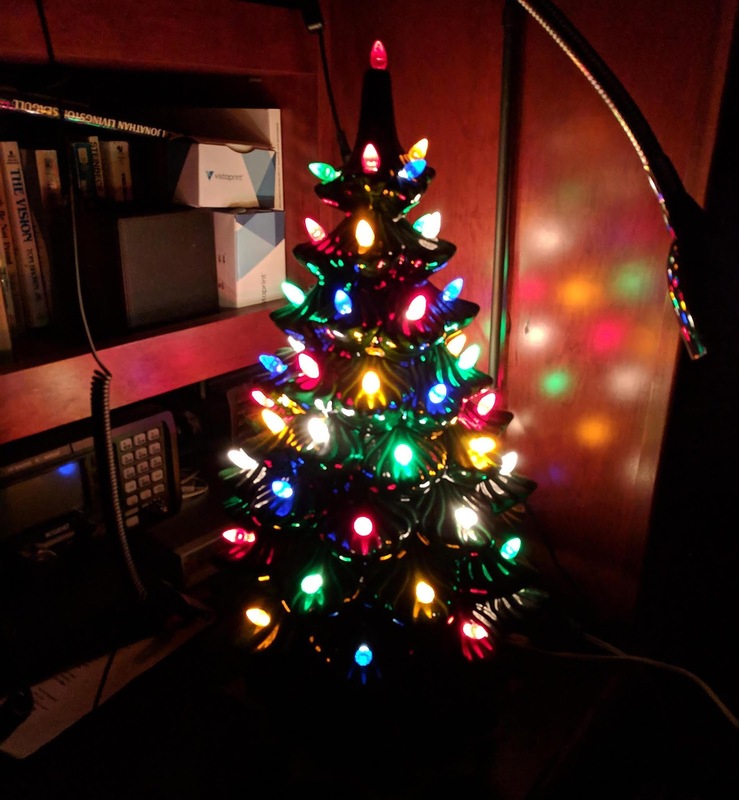 Ever the good son-in-law, I replaced six dimmers with LED-compatible ones while we were there. I was mostly recovered enough to drive out for a previously scheduled visit with our good friends John and Linda in Cameron Park in the Sierra foothills, who moved there this year after a long time in San Jose not far from our place. From Cameron Park we continued over the hill to Sparks for a brief stay at the home of good friends Julie and Jim and a visit with my dear friend Dee, all of whom we have not seen since before we bought the boat. New Years Day fell on a Tuesday this year, and we had a great time catching up with our many motorcyclist friends from our "Tuesday Night Dinner" crowd, hosted for the occasion at the home of our good friends Kevin and Angela. A big shout out to everyone who came down to see us. In the course of the two weeks we also got in visits with all of Louise's parents as well. Trying to cram lots of visits and errands into a limited budget of time always makes the visiting seem too short. But by the same token, after a bit more than two weeks we were very ready to come home to the comfort of our own bed, our own stuff, our own food, and our own cat. We spent the entire day Friday traveling. We were very relieved to find all well aboard Vector when we returned, and a big thanks to friends Steve and Barb aboard Maerin for keeping an eye on her for us while we were gone. It also helped my peace of mind to be able to look in on things daily with our camera system. 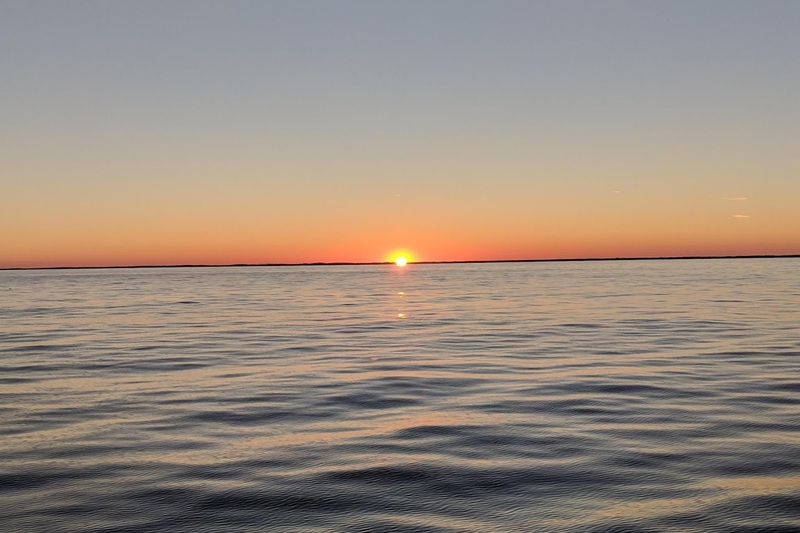 Sunset offshore of the First Coast. Our one-month booking at Ortega Landing was up yesterday, but between having to pick up the cat and my scooter, and the jet lag, we were ill-equipped to depart. We extended one night, to this morning, to get everything done. 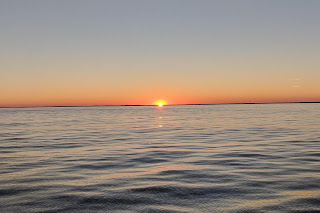 From there we were prepared to just head downriver to our familiar anchorage or maybe one of the free docks, but by pure chance today through tomorrow happens to be a perfect window for an offshore passage. The window is actually good enough to have gotten us all the way to Fort Pierce, or maybe even Palm Beach or beyond, but also by chance we have three sets of cruising friends who are in or near the Space Coast at the moment, and as long as we are going right past we did not want to miss them. So we are coming back in at Port Canaveral, and we'll proceed down the ICW from there, have our visits, and if conditions permit we can go back out again at Fort Pierce. This morning we decked the scooters and dropped lines at the peak of high tide, 11am. There is less water overall in the river right now than when we arrived, and even with the high tide departure. our sounder registered as low as 5.3' crossing the bar on our way out of the Ortega. We never even slowed down, so the sounder was reading the top layer of some very soft silt. Ironically, today is the nicest weather we've seen since arriving, although we heard there were several very nice days while we were away. The marina has a very nice pool and hot tub, but until today it was never warm enough to want to walk the full length of the dock in a robe to try them out. Still, it was an absolutely gorgeous cruise down the Saint Johns. Leaving right at high tide meant we had a knot of current against us for the first couple of hours (the current does not reverse at the same time as the tidal maxima), but by the time we were passing the container terminals our fortunes changed, and at one point we had three knots behind us, whizzing downriver at close to ten knots. Today is Epiphany but we have not had a chance to put away the decorations since returning. 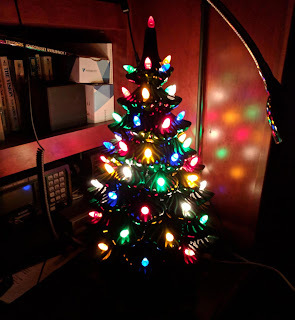 I turned the tree on for the evening in the salon; one last hurrah. It's been a perfect afternoon and evening on the ocean, nearly flat calm. There is little current to speak of and we are doing our normal cruising speed of around 6.5 knots. As I wrap up typing we are just abreast of St. Augustin and we can see the many lights of the city some ten miles off our starboard beam. We had a very nice dinner on board and I am about to take the evening watch, with Louise turning in. She will relieve me at 03:00. At our current speed our ETA is around half past noon. With any luck the free dock at the west end of the harbor will be available, otherwise we will proceed through the lock and anchor in the Banana River. We should have a relaxing (and sleepy) afternoon aboard, and we'll work on connecting with friends on Tuesday or so. My next post here will likely be after those visits. I'll keep an eye out for Odyssey from our place in Stuart -- we overlook the ICW at the intersection of the St. Lucie Inlet. Keep your eye on the blog here to see if we go that way. Depending on conditions we may go right back out at Fort Pierce and run all the way to Everglades. We'll wave if we pass. Oh, and you're looking for Vector; Odyssey was the name of our bus that we no longer own. Sean, i go out for a week at a time. 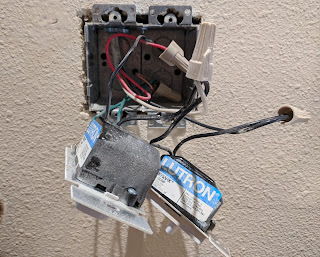 I don't want to come home and worry about whether the fridge/freezer lost power. Therefore I have a glass in the freezer filled with ice and a penny on top.I check it when i get home. Once the penny was half way down the glass, i knew I had lost power. Threw that stuff out, but i didn't get sick! Something you may want to when leaving Vector for a bit.